One of the coolest parts about our family’s experience with 4-H, especially being part of our local Wildlife Watchers club, has been learning how to landscape to attract birds and butterflies. Our “garden,” such as it is, is a work in progress, but it’s getting there. And we’ve got proof – a bunch of spring wildlife has arrived in recent weeks. We’ve got a bunch of bunnies… squirrels… chipmunks… slugs… and plenty of robins. We do occasionally get hummingbirds, though we haven’t seen any so far this year, but we did spot this beautiful fellow for the first time in our yard last week. 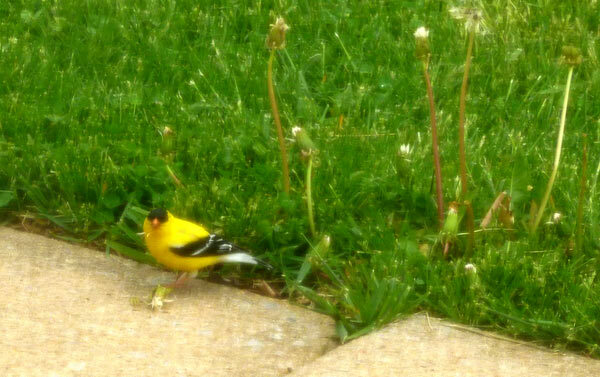 He’s an American Goldfinch. 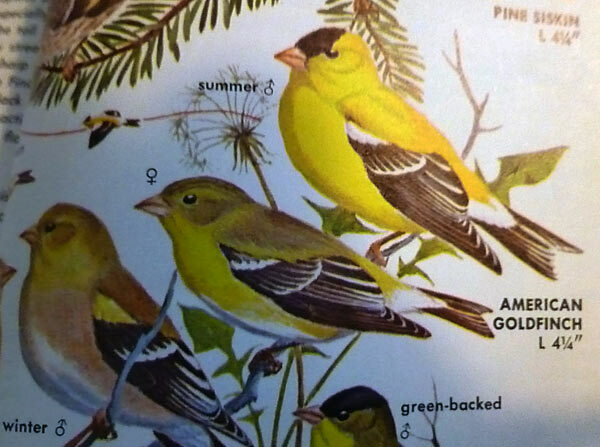 Sarah was pretty sure that’s what type of bird it was – “some kind of goldfinch,” she said – but we pulled our our trustiest bird book (a 1970s copy of Birds of North America, almost a family heirloom!) to double-check, and then found she was very right! Interestingly, one thing we watched this tiny bird do was jump on our dandelion stems, pushing them so that the puff at the top of the now-withering dandelion was more at his level before eating the dandelions. Dandelions are one of their favorite snacks! Reason #100 why I’m glad we, unlike most of our neighbors, haven’t hired a lawn service to get rid of them! 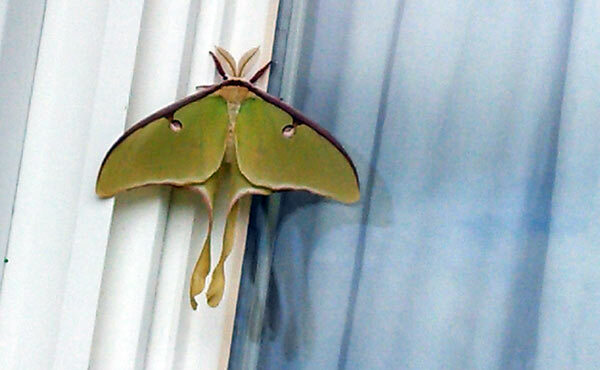 Which, as it turns out (and after we investigated from inside as well and got a good close-up of the antennae)… is a luna moth! This identification, too, came from one of our many wildlife books, this time an Eyewitness Books guide to butterflies and moths. 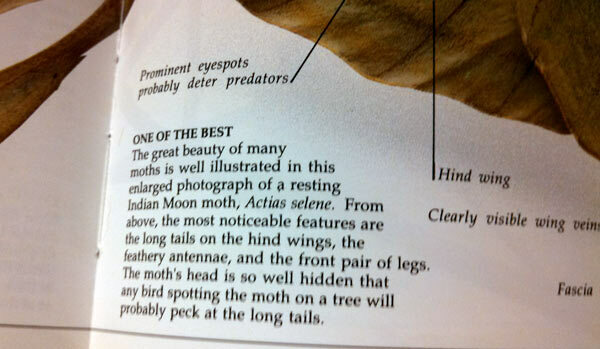 We actually have better “ID guides” for moths and butterflies, but Sarah found this one and I said, “Well, we can page through and see…” and lo and behold, here it was! 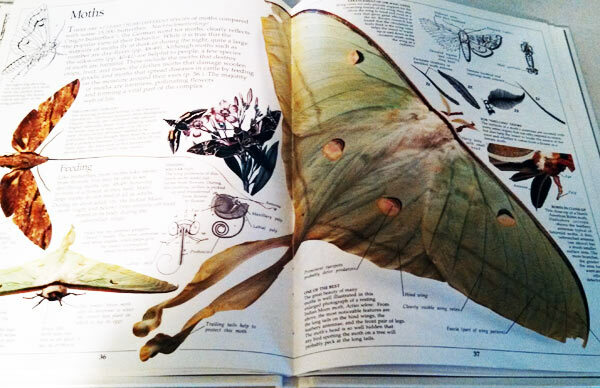 The one in the book is an Indian moon moth, but there are many variants of the moon moth or luna moth, Actias selene. After doing some extra reading online (thanks to a gentleman who breeds these from his home in Canada! 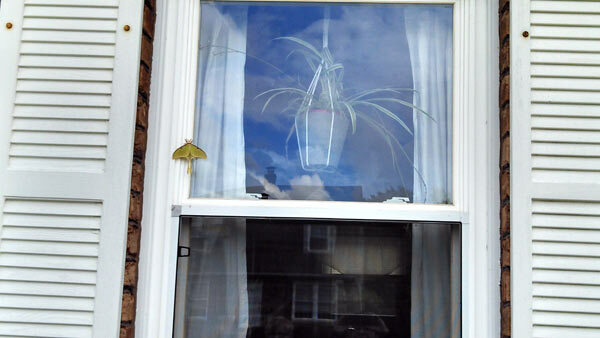 ), we realized that our moth was looking for a mate. She (we think) fought the good fight, but we may have caught her on the post-mating downcycle, which is pretty short. 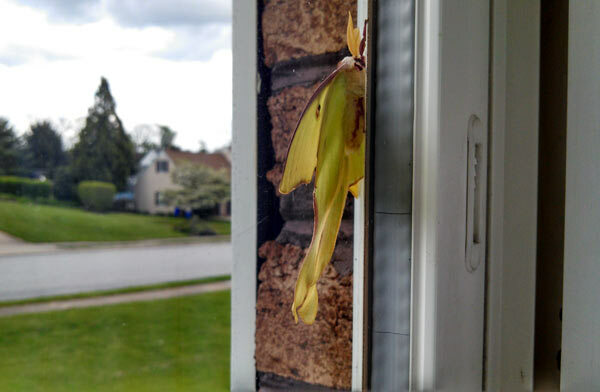 It turns out that adult luna moths don’t even have a proboscis or mouth – no way to eat. They only live as adults for about a week, and they do so entirely subsisting on food from their caterpillar stage. This moth held on to our window for quite a while, but it was a SUPER windy day, so eventually it fell to the ground, whereupon Chris and I, ridiculous nature-lovers, carefully scooped it up along with the mulch it was clinging to and helped it to a nearby lilac tree, where again it hung on through some ridiculous weather. We thought it flew away, and maybe it had – but later, Chris found it on the ground under the tree, bedraggled, wings torn, but still kicking! This entry is about 4-H, animals, books, outdoors. The previous post was 10 "toys" that have lasted into Sarah’s teenage years. The next post is 9 must-read books that changed my life. As keen wildlife watchers, particularly when it comes to birds, I have to say that we are envious. Birds in your part of the world are prettier and more colourful than the majority of ours! We are VERY blessed here in Pennsylvania to have some wonderful wildlife! And the different parts of the state are so different – we live in southcentral PA, but we went to Erie, on Lake Erie in northwestern PA, a couple years ago and saw many new-to-us species, still in our same state! What amazing finds, and what gorgeous pictures. I love how you showed the identification process. My two youngest enjoyed this post. Oh, I’m glad they did, Phyllis! Thanks for stopping by! 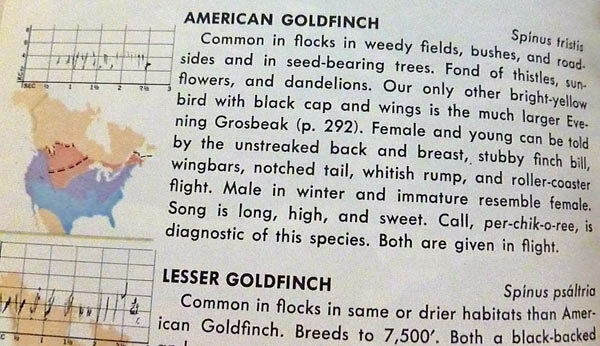 I love your visitors, and I just had to comment because we have the same bird book! In fact, my MIL just gave it to my son last week, and he’s had his nose in it ever since! He’s an avid birder, and because of his intense interest over the past couple of years, our entire family has begun birding as well. We live in north Florida, and have many species that live here year-round, but the coolest thing is that we also get many migrating species in both spring and fall. We’ve seen some rarities this spring at our feeders, and they’ve brought excitement and joy to us. Oh, that’s too cool! We are big into birds, and we have a surprisingly high variety for where we live too – I’d love to see Florida’s birds, for sure!